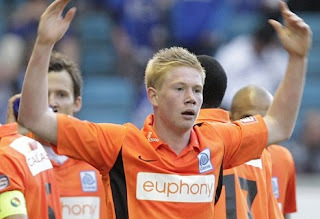 Chelsea have reportedly lodged a £9million bid with Racing Genk in an attempt to prize away Kevin De Bruyne. The new offer comes after an initial £5.3million offer, which was immediately thrown out by the Belgian club. Genk are resigned to losing their highly-rated left winger, although they’re hoping any deal struck with Chelsea can result in the 19-year-old being loaned back to them. Anderlecht are also said to be keen on De Bruyne, and previous reports have suggested that he’d be included in a complicated player-plus-cash deal involving Romelu Lukaku. The idea being that Lukaku and De Bruyne would both be bought by Roman Abramovich, with the latter being immediately loaned out to Anderlecht for two years.